The Beijinger, as its name suggests, is the guide for those in the nation’s capital. Listings for almost anything can be found here: upcoming events, such as music gigs, international forums, the latest reviews of the cafes in the capital’s many laneways, or bars in the famous upmarket Sanlitun district. The Beijinger provides the hub for classifieds in Beijing, and is a comprehensive resources for job seekers, those looking for a new home, language exchange partners, and even friendship and interest groups. Check out the blog for latest updates on China’s visa situation, issues affecting this rapidly growing city, and latest trends and news in China. The forum component of the site needs updating as it is not totally user friendly and is also unfortunately marred by a number of “trolls”, particularly when users are asking about sensitive issues relating to changes to visa legislation and related matters. While possibly not as well set out as the likes of City Weekend, or local Chinese site “Dianping” for food reviews, there are a number of reviews for some of the preferred laowai haunts in town. The site also runs some fun, interactive competititions, including the “best burgers in Beijing competition” which had local Western food eateries getting in to the competitive spirit and drawing great controversy from all corners of the expatriate community! The Beijinger is the first place to look when moving to Beijing. Similar to Shanghai CityWeekend, Beijing CW’s content is driven by events and listings for restaurants and nightlife. View today’s events by category: performances, parties, art exhibitions and all the hottest deals around town. Articles and content are fresh and lively; read up on interesting new restaurants or little-known hole in the wall eateries. Event write-ups, eg. a “Halloweekend” guide, give readers a glimpse of what’s going on around the city, comparing different party options. The Places in Beijing section breaks things down by community, culture, books, art, home and office, film, stage, shopping, and travel, and provides good descriptions of what to see and do. 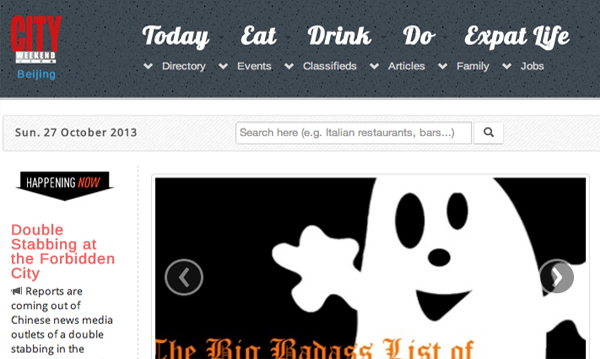 Users can comment on the restaurant/bar reviews and leave star ratings. 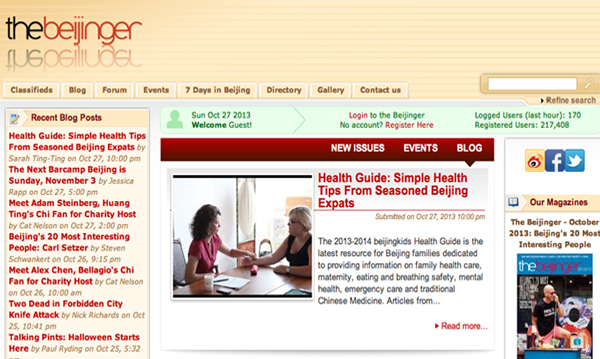 Beijing CW’s Expat Life section is also a good resource, providing information for new arrivals on hospitals, health care, services, relocating with family, finding a maid/housekeeper, learning Mandarin, and more. Posted on October 27, 2013 by danielleflaing. This entry was posted in Cities and tagged Beijing. Bookmark the permalink.